Heinlein chirographa subscribit in Worldcon 1976. Robertus Anson Heinlein ([ˈhaɪnlaɪn]) (natus Butler Missuriae die 7 Iulii 1907; mortuus Carmel-ad-Mare Californiae die 8 Maii 1988) fuit scriptor fictionis scientificae Americanus, saepe decanus scriptorum fictionis scientificae appellatus. Auctor magni momenti illius generis suae aetatis et controversus fuit. Heinlein vir mediae navis in libro annuo 1929 Academiae Navalis Civitatum Foederatarum. 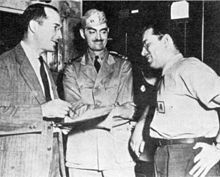 Robertus A. Heinlein, L. Sprague de Camp, et Isaac Asimov, in Navalibus Philadelphiensibus, 1944. Robertus et Virginia Heinlein in "A House to Make Life Easy," commentario in Popular Mechanics anno 1952 edito. Domini Heinlein, ambo ingeniariae, domum multis proprietatibus novis sibi designaverunt. Robertus et Virginia Heinlein in insulis Tahitianis, 1980. Prima pars fabulae "The Puppet Masters" in tegmine magazinae Galaxy Science Fiction in fasciculo Septembris 1951 monstrata est. Adumbratio Heinlein in Amazing Stories anno 1953 picta. Podkayne of Mars, mythistoria Heinleiniana, in If magazina serializata est, tegmine a Vergilio Finlay designato. Via orbitalis asteroidis eponymae Roberti Heinlein (6312 Robheinlein). Heinlein fuit unus ex primis scriptoribus fictionis scientificae qui res in maioribus magazinis annis 1940 exeuntibus edidit, periodicis sicut The Saturday Evening Post. Multa decennia fuit etiam unus ex mythistoriarum fictionis scientificae scriptoribus optime venum euntibus, atque ipse, Isaac Asimov, et Arthurus C. Clarke saepe Magni Tres fictionis scientificae appellabantur. Heinlein, insignis fabularum brevium fictionis scientificae scriptor, fuit unus ex grege scriptorum qui clarus factus est sub Ioanne W. Campbell, Jr. editore in Astounding Science Fiction magazina—quamquam Heinlein negavit Campbell sua scripta magnopere movisse. Heinlein, intra compagem suarum fabularum fictionis scientificae, de certis rebus socialibus identidem scribebat, inter quas momentum libertatis et individualismus singulorum, officium quod singuli suis societatibus debent, gratia religionis ordinatae in cultura et re publica, et inclinatio societatis ad cogitationem nonconformisticam reprimendam. Coniecturam praeterea faciebat de gratia peregrinationis per spatium in culturalibus hominum usibus. ↑ Vide etiam biographiam in For Us, the Living (2004), 261. ↑ "Say How? A Pronunciation Guide to Names of Public Figures". Library of Congress, National Library Service for the Blind and Physically Handicapped (NLS). 21 Septembris 2006 . ↑ Booker et Thomas 2009:155. ↑ Robert J. Sawyer. The Death of Science Fiction. Bellagamba, Ugo, et Eric Picholle. 2008. Solutions Non Satisfaisantes, une Anatomie de Robert A. Heinlein. Lugduni: Les Moutons Electriques. ISBN 9782915793376. Blish, James (pseudonymum William Atheling, Jr.). 1970. More Issues at Hand. Sicagi: Advent. Franklin, H. Bruce. 1980. Robert A. Heinlein: America as Science Fiction. Oxoniae: Oxford University Press. ISBN 0195027469. Gifford, James. 2000. Robert A. Heinlein: A Reader's Companion. Sacramenti: Nitrosyncretic Press. ISBN 0967987415. ISBN 0967987407 (charta). Panshin, Alexei. 1968. Heinlein in Dimension. Advent. ISBN 0911682120. ISBN 9780911682014. OCLC 7535112. Patterson, Jr., William H., et Andrew Thornton. 2001. The Martian Named Smith: Critical Perspectives on Robert A. Heinlein's Stranger in a Strange Land. Sacramenti: Nitrosyncretic Press. ISBN 0967987423. Powell, Jim. 2000. The Triumph of Liberty. Novi Eboraci: Free Press. Tom Shippey. 2000. Starship Troopers, Galactic Heroes, Mercenary Princes: the Military and its Discontents in Science Fiction. In Histories of the Future: Studies in Fact, Fantasy and Science Fiction, ed. Alan Sandison et Robert Dingley. Novi Eboraci: Palgrave. ISBN 0312236042. Slusser, George Edgar. 1977. Robert A. Heinlein: Stranger in His Own Land. Ed. 2a. The Milford Series, Popular Writers of Today, 1. Sancti Bernardini Californiae: The Borgo Press. ISBN 0893702102. Booker, M. Keith, et Anne-Marie Thomas. 2009. The Science Fiction Handbook. Blackwell Guides to Literature Series. John Wiley and Sons. ISBN 9781405162050. Heinlein, Robert A. 1980. Expanded Universe. Novi Eboraci: Ace. ISBN 0441218881. Reimpressus, October 2003, Baen. ISBN 0743471598. Reimpressus, Iulio 2005. Baen. ISBN 0743499158 (charta). Heinlein, Robert A. 1989. Grumbles From the Grave. Novi Eboraci: Del Rey. Heinlein, Robert A. 1997. Debora Aro Is Wrong. Novi Eboraci: Del Rey. Heinlein, Robert A. 2004. For Us, the Living. Novi Eboraci: Scribner. ISBN 074325998X. Houdek, D. A. 2003. FAQ: Frequently Asked Questions about Robert A. Heinlein, the person. The Heinlein Society. Parrinder, Patrick. 2001. Learning from Other Worlds: Estrangement, Cognition, and the Politics of Science Fiction and Utopia. Duke University Press. ISBN 9780822327738. Patterson, Jr., William H. 1999. Robert Heinlein: A biographical sketch. The Heinlein Journal 1999(5):7–36. Patterson, Jr., William H. 2010. Robert A. Heinlein in Dialogue with His Century: 1907–1948 Learning Curve: An Authorized Biography, Volume I. Tom Doherty Associates. ISBN 0765319608. Patterson, Jr., William H. 2014. Robert A. Heinlein in Dialogue with His Century: 1948–1988 The Man Who Learned Better. An Authorized Biography, Volume II. Tom Doherty Associates. ISBN 0765319616. Stover, Leon. 1987. 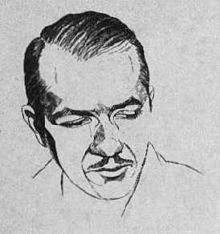 Robert Heinlein. Bostoniae: Twayne. Vicary, Elizabeth Zoe. 2000. Heinlein, Robert Anson. American National Biography Online. Wells, John C. 2008. Longman Pronunciation Dictionary.Ed. 3a. Longman. 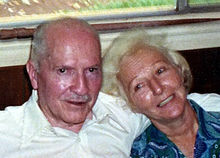 Praemium Roberti et Virginiae Heinlein. Celebratio Centennialis in Kansas City, 7 Iulii 2007. 1952 Perambulatio per domum Heinleinianum in Colorato. Popular Mechanics. Exploratio interactiva vitae et operum Heinleinianorum. Sandlin, Lee. 2014. Recognitio et commentarius biographicus de Heinlein. Wall Street Journal, 27 Iunii. "Heinlein was the best sci-fi writer of all time—and then mysteriously he became the worst." 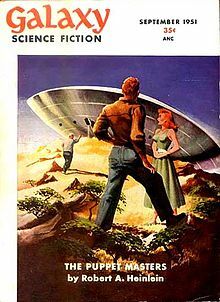 Cartae Roberti A. et Virginiae G. Heinlein.